Divers have described their discovery of a WWI German U-boat that historians believe was destroyed in 1919. All 27 crew on board the UC42 died when the submarine sank at the entrance to Cork Harbour on 10 September 1917. It had been laying mines when an explosion was heard. A team of five amateur divers from Cork discovered the submarine in good condition in 27m of water just off Roches Point on 6 November after a 12-month search. Diver Ian Kelleher said they were very surprised and ecstatic to find it with little obvious explosive damage. Positive identification was possible when they found its number stamped on a propeller. 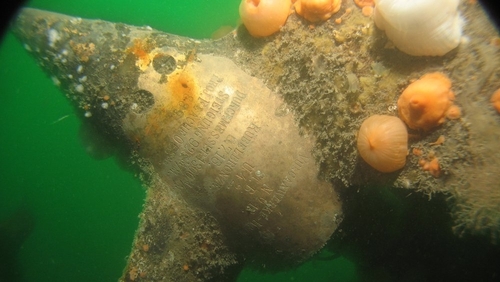 Mr Kelleher, a chemistry student, said that two days before Christmas, the dive team laid a plaque of remembrance near the propellers as a memorial to the 27 German submariners who died. They plan to return to the site over the coming weeks and continue their research into the submarine and its crew, including trying to contact relatives of the crew.